Educate Together is a school patron body and the co-ordinating body for Educate Together Schools. These are state-funded Primary and Second-level National Schools. Its schools provide education based on equality of access and esteem to children irrespective of their social, cultural or religious backgrounds. Set up by parents in the 1970s, Educate Together is the fastest growing provider of primary school education in Ireland today and has garnered particular recognition for its expertise in setting up new schools. There are currently over 12,000 pupils attending 74 Educate Together primary national schools nationwide, including four in County Wicklow: Bray School Project, Blessington, Wicklow and, most recently, Greystones. Educate Together is an independent educational charity with no religious or political affiliations. It is supported by small government grants and extensive fundraising. It is run by a highly experienced, professional executive with a volunteer board. It has created a modern, transparent, accountable and clearly defined standard of patronage for Irish national schools. Educate Together opened new second-level schools in 2014 in Hansfield, Dublin 15 and Drogheda (with Co. Louth VEC). 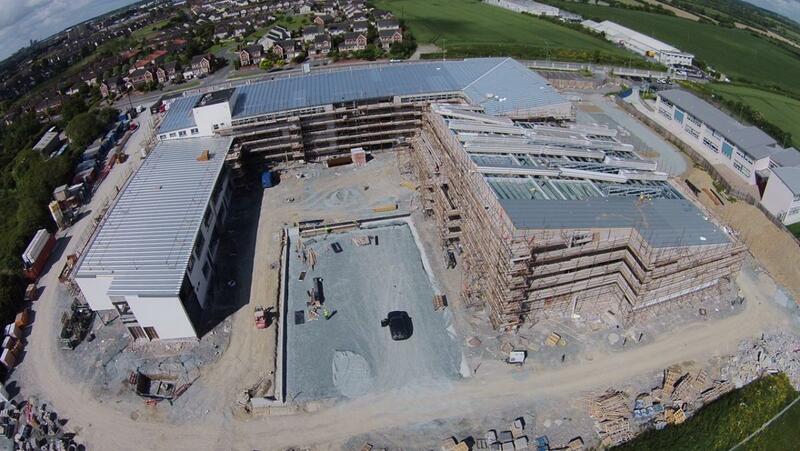 Four new second-level schools will open in 2016 including North Wicklow. What is an Educate Together second-level school like? It takes a learner-centred approach: the needs of the student are considered first in all decisions. The school is democratically run: students, parents and teachers are fully involved in decision-making and planning. It is equality-based: students from all social, cultural, religious and non-religious backgrounds have equal rights and respect in the school. : the school is mixed (boys and girls). An active approach is taken to challenging gender stereotypes and ensuring all students reach their full potential. Educate Together schools represent a new model of second-level schooling; one which provides a positive learning experience for all students; which recognizes students’ individual differences as a resource, stimulating creativity and innovation and promoting the highest educational standards. What is the ethos of an Educate Together second-level school? Educate Together second-level schools uphold the ethos as laid down in Educate Together’s Charter and its four principles outlined above. The schools provide ‘equality of access and esteem to children irrespective of their social, cultural or religious backgrounds’. Management is democratic, relationships are respectful and the school community works to ensure that everyone feels included and enabled to reach their full potential. The ethos affects everything in the daily life of the Educate Together second-level school. Values of equality, human rights and active citizenship are actively promoted. What’s included in Ethical Education? As in Educate Together national schools, all students study Ethical Education as a core subject at second-level. The ethical education curriculum is based on values of equality, human rights and active citizenship. Students are challenged to consider different ethical approaches and belief systems within a clear values framework. 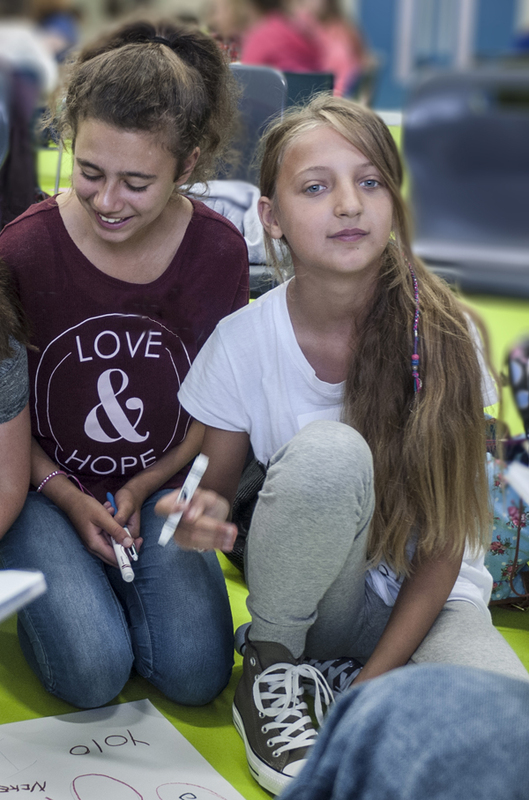 As the concrete expression of the Educate Together ethos, Ethical Education is viewed as a stand-alone subject as well as being interdisciplinary. Each school community makes its own decisions on how best to plan and timetable ethical education. It is usually timetabled for an hour lesson per week. Who develops the school policies? School policies are developed by the school community. Students, teachers and parents are all involved in policy formation; making for strong policies for which everyone takes responsibility. What will it be like moving from primary to an Educate Together Second-level school? The move from primary to second-level is planned to ensure that the transition for all students is smooth. Schools work closely with local primary schools, parents and students to ensure that everyone is familiar with the school, staff and ethos before the start of the school year. How do the schools teach the curriculum? Students experience a broad, balanced curriculum at Junior Cycle. In Educate Together second-level schools all students study the following core subjects: English, Mathematics, Irish and Ethical Education. Students also study a broad range of subjects as well as school-developed projects and courses. Two or more subjects are integrated for these courses and projects. This integrated approach to teaching the curriculum means that learning is active, relevant, connected, challenging and also meets the requirements of the Junior Cycle Curriculum. What kinds of integrated projects do the students do? Lifestyle Choices for Health and Fitness. Students work in teams to on a campaign to promote healthy lifestyles and fitness. They also produce an information booklet ‘My Health – My Choice’ aimed at their peers. The following subjects are integrated in the project: Biology, Home Economics, PE, English. Key skills of literacy and numeracy, communicating, managing information and working with others are embedded throughout the project. What other courses can schools offer? Schools may develop their own innovative courses in areas such as: Make a Robot, From Page to Stage, Mock Trial, Sports Coaching, Danceability and many others. 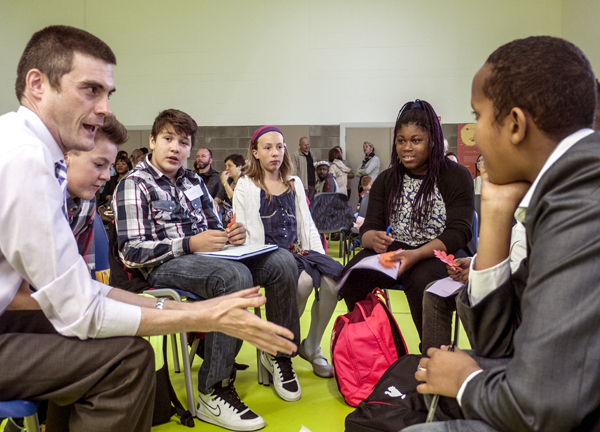 How will students be grouped in the Educate Together second-level schools? At Junior Cycle, students are grouped into mixed ability classes. However, if students are following different courses (such as Higher or Ordinary level Mathematics) they are grouped accordingly. Schools also create ‘small learning communities’ so that students can develop good relationships with teachers and with each other as soon as they arrive into first year. What are ‘small learning communities’? Does that mean that students will be in classes of less than 20? No. What we mean by small learning communities is this: each class group of first year students is matched to a small team of teachers, so both teachers and students can develop good working relationships with each other. A teacher may be the class tutor, for example, and also teaches the same class group one or two subjects. This makes the transition to second-level easier, and also helps to foster positive relationships between students and teachers early on. It is also recommended in the Taking the Next Step: A Blueprint for Educate Together Second-level Schools that year groups have their own year ‘spaces’ in the school. As the schools grow to their full capacity, an inclusive, welcoming experience for all students can be maintained with smaller learning communities within the larger school. Students are assessed on an ongoing basis, not just on what they have learned at the end of a topic, but also on how well they are progressing. Assessment is used as as an important tool for planning; teachers take individual students’ strengths, weaknesses and needs into account when developing lessons. Teachers set learning goals and provide regular feedback to students on their progress. They also assess the students’ learning through regular tests, assignments and projects. How will the schools support students with special educational needs? Educate Together second-level schools welcome students with special educational needs. Teachers in the special educational needs team will work closely with subject teachers to support individual students in accessing the curriculum and helping them achieve their full potential. The school provides a supportive learning environment to help exceptionally able students develop their own learning strategies around their interests and capabilities. How will ICT be used? The schools have an ICT infrastructure that supports the very best learning and teaching approaches, using technology as a tool for learning across the curriculum. ICT is integrated into the learning environments so that it can be used as a learning tool and to link school, home and the local and global community. Will there be extra-curricular activities? Yes. Educate Together promotes an active approach to extra-curricular activities and learning. The schools aim to develop a rich range of sporting, artistic, academic, practical and other educational activities. Who will be on the board of management? Educate Together’s school management process ensures that parents, students and teachers all participate in decision-making in the school – at the planning stage and on an ongoing basis. All second-level schools have parent, teacher and patron nominees on their boards of management. The patron nominees reflect the Educate Together ethos and the local community. In addition, Educate Together voluntary secondary schools have associate student members on school boards of management. This is an innovation in the Irish context. There will be a parents association / parent teacher association at the schools. However, parental involvement goes beyond membership of Boards of Management and Parent Associations – it reflects a partnership approach between teachers as professional educators and parents as the primary educators of their children. What is the approach to discipline? Educate Together second-level schools develop codes of positive behaviour which the whole school community agrees on. Students, teachers and parents work together to develop such policies. This means that rules, sanctions and rewards are agreed and well-known by all, and everyone feels a shared responsibility to uphold them. Codes of positive behaviour are based on the rights and responsibilities of all members of the school community to ensure that every student can learn in a safe, friendly, environment and can achieve their full academic and social potential. Educate Together second-level schools do not have compulsory uniforms but agreed dress codes that promote safety, learning and equality. The school principals and boards of management consult with the whole school community to decide on an agreed dress code for each school. Who can apply for places at Educate Together second-level schools? As in all schools, the boards of management will decide on the school’s Admissions Policy, with the patron’s approval. They are based on the principle of equality of access to the school for all members of the local community. Admissions policies are published on each school’s website. My child did not attend an Educate Together National school. Is that a disadvantage? Each school develops their own admissions policy (see relevant pages). Usually priority 1 is for children who reside in the local catchment area, and is not feeder school based. Priority 2 is for children who have attended Educate Together national schools. Educate Together’s core principle of equality of access for all members of the local community is upheld. Do the schools charge fees? What will the school buildings be like? Educate Together has been working with the Department of Education and Skills and its partners to ensure the best possible learning environment is provided in Educate Together second-level schools. The buildings themselves are seen as a resource for teaching and learning and also allow for flexibility inside and outside the classroom so that practical and applied learning can take place. There will be at least one flexible learning space in the new school buildings. The school campus can also be used as an opportunity to promote environmental awareness and responsibility. Which modern foreign languages will be available to first years? Educate Together schools endeavour to recruit highly qualified teachers in all subject areas, including Modern Foreign Languages (MFL). It is hoped that students are enabled to experience ‘taster’ courses in selected foreign languages, rather than having to choose one language prior to entry to first year. What are your plans for Senior Cycle? Educate Together second-level schools develop their own distinctive Senior Cycle programme, starting with Transition Year, to suit the needs and interests of their students. Leaving Certificate students in 5th and 6th Year build on the knowledge, skills and experiences gained at Junior Cycle and Transition Year. Each student will be encouraged to achieve the very best qualifications they can. Other programmes such as LCA, LCVP, as well as alternative qualifications such as FETAC may be offered. What will the facilities be like in the first school year when some of the schools may be in temporary accommodation? The Department of Education and Skills ensures that new schools in temporary accommodation are fitted with general and specialist facilities from the beginning of first year. Even though the fit-out may be temporary, students are enabled to study specialist subjects such as Home Economics, Science, Technology, Art & Design with the appropriate equipment and surroundings. Why are students on the board of management? The rationale for students being ‘associate’ members of schools’ boards of management is outlined in the Educate Together Blueprint. Students’ active involvement in decisions about their lives enables them to become successful learners, confident individuals and responsible citizens. Will the teachers and students address each other by first names? In all Educate Together schools, students and teachers commonly address each other by first names. This reflects the equality-based ethos and is an example of how all members of the school community are treated with respect. View the Educate Together second-level schools brochure here. The Department of Education and Skills has not yet announced the location of the new school. However, it will be in Bray, Co. Wicklow.